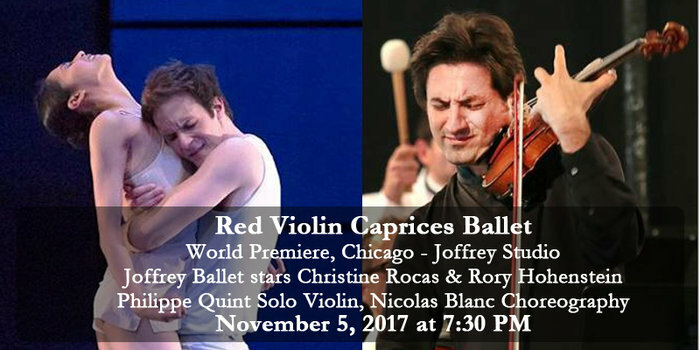 Stradivari Society recipient of the “Ruby” Stradivari Philippe Quint will perform in the world premiere of the ballet he commissioned, the Red Violin Caprices, starring Christine Rocas and Rory Hohenstein of the Joffrey Ballet with music by John Corigliano and choreography by Nicolas Blanc. The performance is part of a gala event presented by Embarc and will be held at the black box theatre in Joffrey Tower, 10 E. Randoph St., Chicago, at 7:30 pm. Only 160 seats are available at this rare and intimate event, titled, “A New Movement.” The evening is an amazing opportunity for business leaders, philanthropists, dancers, and dance enthusiasts to unite in support of bringing similar forms of art and culture exposure to Chicago’s most underserved students. For the sixth year, this exclusive, one night only presentation of neo-classical and contemporary pieces is choreographed and danced by the stars of Chicago’s renowned Joffrey Ballet. The performance will be followed by a reception, featuring craft cocktails, hors d’oeuvres and a silent auction. All of the proceeds from the evening will go directly to Embarc and the more than 700 students that it will serve in the 2016-2017 school year. To find out more about Embarc and the event, click here. For more on Philippe Quint, go to philippequint.com.